When it’s 103° outside, what do you do? You pull out the Instant Pot for a quick and tasty dinner, like these Salsa Verde Soy Curls. Roasted peppers, fresh Tomatillos, and Soy Curls were simply meant to go together! You’re going to HAVE to taste this to believe how good it is! Move over chickens, your days are numbered. I know, how can you roast peppers when it’s so hot outside. Easy, I used my toaster oven! And if you don’t have one, you could simply fire up that old grill. We’re just looking to put a little char on some tomatillos and a few peppers. This is seriously an easy recipe….while my peppers were roasting I had my Soy Curls soaking. Meanwhile I was chopping up my other veggies directly into my instant pot. Then I added my roasted veggies and set it to MANUAL for 5 minutes. A quick blend with an immersion blender (or into a regular blender) makes the BEST Salsa Verde you’ve ever tasted. Toss in the drained Soy Curls and set your IP for another 5 minutes and dinner is ready. Garnish with freshly shredded lettuce, chopped tomatoes, and maybe a dollop of my Green Chile Sour Cream. Serve with my Instant Pot Spanish Rice and/or my Instant Pot Refried Beans. Can you tell I like my Instant Pot? First we’re going to remove the papery husk on 6 Tomatillos. Cut them in half and then arrange them on a cookie sheet. Next, cut off the stems from a Green Bell Pepper, a Poblano Pepper, and a Jalapeño. Cut each pepper in half and remove the membranes and seeds. Careful – you might want to wear gloves – those seeds contain an oil that will seriously burn your eyes. Arrange the peppers alongside your tomatillos and broil in your toaster oven for 10 minutes. If you don’t have a toaster oven use your grill. If you don’t have a grill, you can broil them in your oven…..keep watch, we just want to blacken them a little. After 10 minutes, flip the veggies over and broil another 10 minutes. Again, timings are approximate – keep watch, we just want a little char….that’s it. Meanwhile, while the peppers are roasting, add 3 cups of dried Butler Soy Curls to a large bowl. Add just enough hot water to barely cover and stir in 2 Tablespoons of Low Sodium Soy Sauce and 1 tsp of Poultry Seasoning. Give that a good stir and set aside. While all that’s happening, peel and chop 1 onion and add it directly to your Instant Pot. Also add ½ of a Red Bell Pepper, 6 large cloves of chopped garlic, an 8oz can of Chopped Green Chiles, and 1½ cups of Low Sodium Vegetable Broth. When your peppers and tomatillos are finished roasting, toss them in too. If you like your food SPICY – add the whole jalapeño……otherwise just use half. Attach your IP lid, make sure it SEALED, and set the timer for 5 minutes on MANUAL mode. After the timer goes off, either let it vent naturally or do a quick release (use a wooden spoon and be careful) to vent the steam. 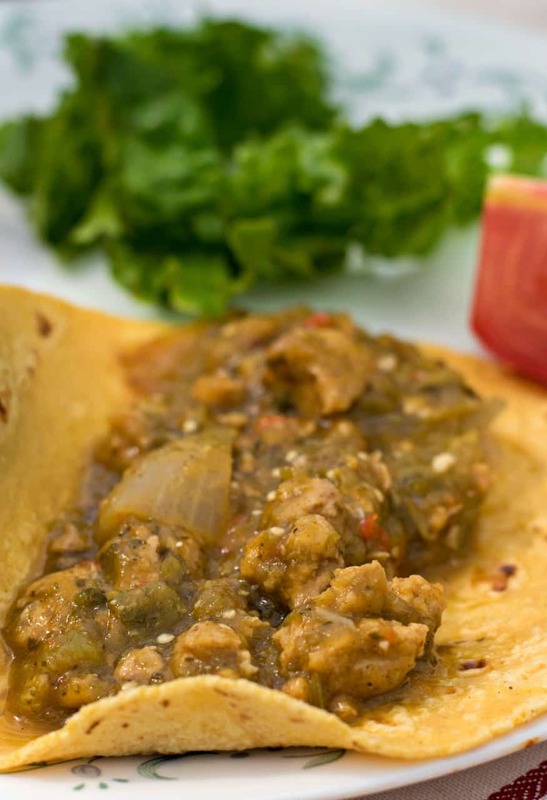 Stir in a ¼ cup of packed, chopped cilantro, 2 tsp of Ground Cumin and ½ tsp salt and mix well. If you happen to have an immersion blender, perfect…because now we’re going to blend all that peppery goodness until we have some of the best Salsa Verde you ever tasted. If you don’t have an immersion blender, then mix in your regular blender in small batches and return to your IP. Now we’ll add those Soy Curls. First, drain them and squeeze out as much water as you can. Then, if you like your ‘chicken’ shredded, give them a quick chop, otherwise toss them directly into your IP and Salsa. Give that a quick stir to mix, and then re-attach the lid, make sure it’s set back to SEALING, and cook for another 5 minutes on MANUAL. Again, either let it manually vent when it’s finished or very carefully do a quick release. Remove the lid and squeeze in the juice of 1 lime (about 2 tablespoons). Good huh? Now grab those oil free corn tortillas and have yourself a feast. Again….who says plants are boring? 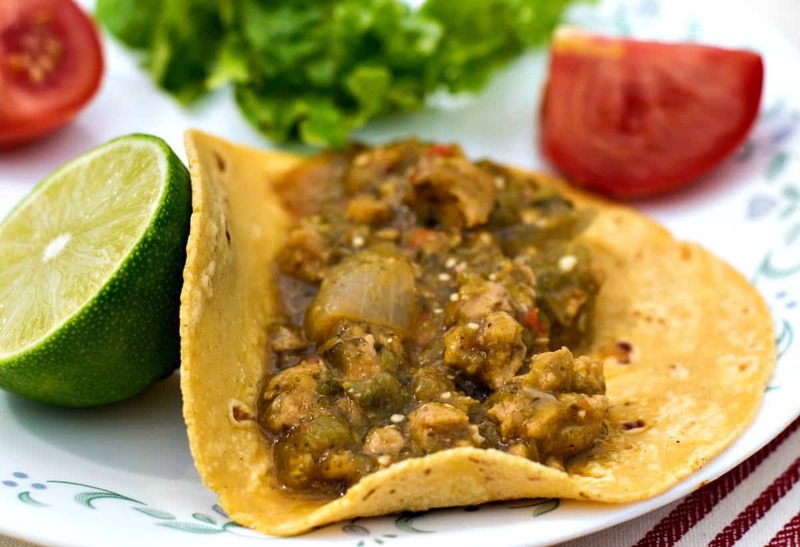 Remove the husks from the tomatillos and cut them in half. Arrange them on a cookie sheet. Cut the Jalapeño, Green Bell Pepper, and Poblano in half. Remove the stems, membranes, and seeds. Wear gloves to avoid getting seed oil on hands and/or in eyes - it DOES burn. Arrange peppers on cookie sheet with tomatillos. Roast or broil the pepper for 20 minutes, flipping after 10 minutes. Use your regular oven broiler, toaster oven, or even a grill....you just want to char (blacken) the skins a little. While peppers are roasting, add soy curls to a large bowl. Add just enough hot water to barely cover (or a little less) and add soy sauce and poultry seasoning. Mix well and set aside, stirring occasionally. Meanwhile, peel and roughly chop the onion directly into your Instant Pot Pressure Cooker. Also add the peeled garlic, red bell pepper, green chiles, and vegetable broth. When the peppers are finished roasting, add them into the IP and attach lid. Make sure lid is SEALED and set to MANUAL for 5 minutes. Allow to naturally vent or carefully do a quick release. NOTE: For SPICY Salsa add the entire Japaleno - for MILD just add half. Add cilantro, salt, and cumin, and either using an immersion blender (preferred) or a normal blender, blend contents of IP to a salsa like consistency. Smooth or chunky - your choice. Drain soy curls and squeeze out any excess moisture. For a shredded texture, chop soy curls using a sharp knife and cutting board, otherwise add them directly into the IP with the salsa. Re-attach lid, re-set to SEALING, and cook on MANUAL for an additional 5 minutes. Again, either allow to vent naturally or do a quick release. Serve with your choice of tortillas. Garnish with shredded lettuce, chopped tomatoes, or slices of avocado. Goes great with my Instant Pot Spanish Rice and/or Instant Pot Refried Beans. Here are some convenient links to some of the products I used in this recipe. Note: All links are Amazon Affiliate Links, meaning I will receive a commission for every purchase. Is there any way you can do this without the Instant Pot? Use a regular pan – heat the veggies until they’re soft enough to blend. Add the soy curls and continue heating until it’s thickened. Ooo never though thought to use my toaster oven for this, thanks for the tip and the recipe with the soy curls – maybe instead of only having them when we dine out we can make our own to our heat level! This is something im gonna make tomorrow. It’s got the instant pot, soy curls, any type of salsa and a taco! I’m past the tri-fecta it can’t go wrong. Quick top instead of chopping your rehydrated soy curls to shred ( too much labor for me) use your immersion blender, regular blender or few pulses on food processor and it’s perfectly shredded soy curls. Thanks for your great recipes.